"The main museum building of the Philadelphia Museum of Art opened to the public" "in 1928. It was designed by a collaboration of three associate architects from Philadelphia: Charles L. Borie, Jr., Horace Trumbauer and C.C. Zantzinger. Today the iconic building seated atop Fairmount Park stands as a beacon to the importance of art and culture throughout Philiadelphia." "By the end of the 1990s, the Museum had grown significantly and it was determined that a substantial expansion of its facilities was required, presenting a range of very difficult planning issues. 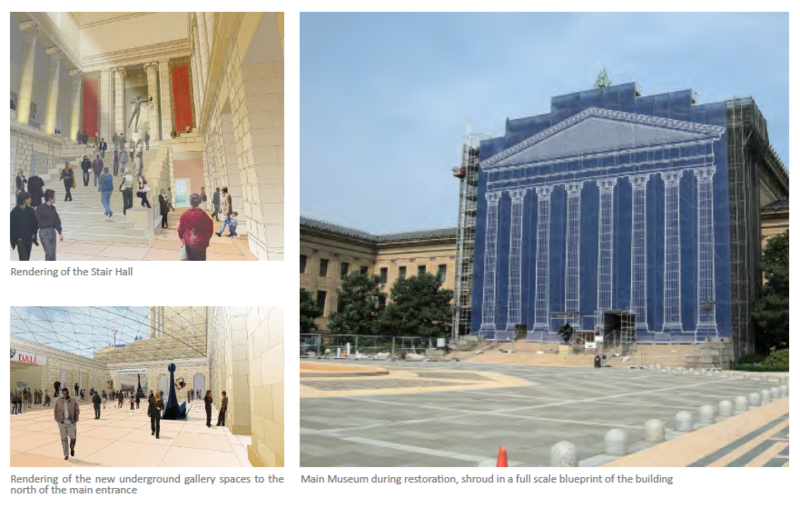 In 1999, VITETTA was selected to prepare an “Integrated Master Plan” for the Museum to provide a road map to the expansion process and determine how necessary infrastructure improvements and facility upgrades could also be completed." "The focus of VITETTA’s “Integrated Master Plan” was to consolidate and prioritize the maintenance, upgrade and expansion projects into a single implementation plan, to occur over a ten-year period. VITETTA’s work commenced with extensive programming and space planning interviews with each of the Museum’s thirty-five departments, which took place over a three-month period." "VITETTA then wrote a program that summarized the growth of each department, carefully calculating the actual space needs of each activity/gallery, storage and office space rather than by using standardized formulas to determine needed expansion space. This provided a comprehensive document that focused on each department’s critical information regarding the number and size of galleries needed and the impact of adding compact storage." 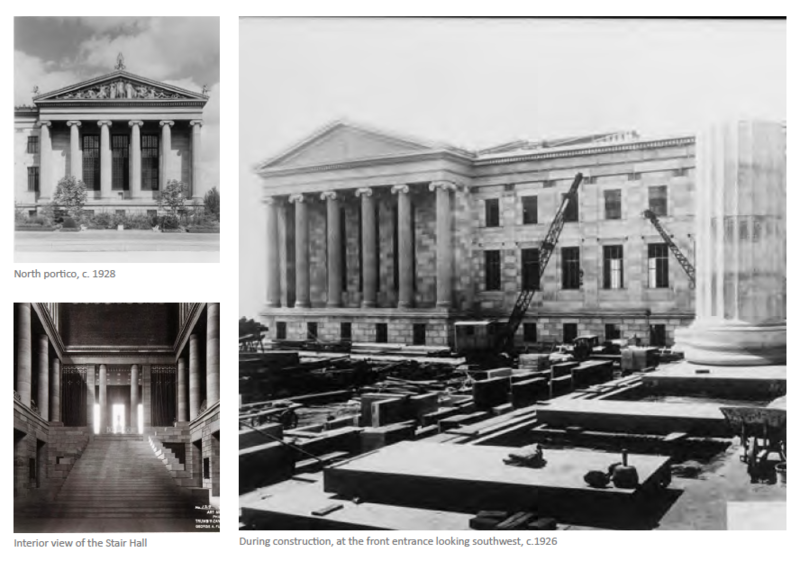 "Studies were prepared exploring how an expansion could be accomplished within the 1920s Main Museum building without changing the exterior of the building or its historic features. From the studies, VITETTA developed a plan to put the expansion underground below the existing plaza, imposing no visual impact to the exterior of the building while increasing its overall square footage. The expansion would also allow the original building to be viewed and experienced in new ways. The plan also proposed two additional gallery buildings, the Perleman Building and the Rodin Museum, as well as a future art storage building." Simultaneously, VITETTA was completing a window study for the main museum. One distinctive feature of the original architecture of the main museum building is that its facades are generously articulated with windows, for the most part being bronze- framed, single-glazed windows fabricated by Tiffany Studios of New York. During the winters, heavy condensation would cover the windows, and their inefficiency lead to high energy use and operating costs. VITETTA developed a window improvement designed to marry the existing historic windows with new high-performance interior windows. Our solution enabled the Museum to avoid the cost of a new perimeter steam radiation system in the building in the future – which in itself would more than pay for the cost of the window improvements – and generate annual operating cost savings of approximately $690,000. In 2005 VITETTA was asked to complete the documentation and restoration work for the exterior envelope of the Main Museum. The building was in a degraded condition. Typical cyclical maintenance work had been deferred since the exterior envelope was last renovated in the 1970s and water infiltration had begun to cause serious damage. Areas where this was of particular concern included the gutters, roof drains and valley flashing of the terra cotta tile roof, as well as open mortar joints throughout the stone facades – especially at projecting cornices and moldings. Active water leaks existed throughout the building’s attic where the gutters, drains and flashing had failed and required a number of temporary measures within the attic to protect the building and collections below. Other conditions that required careful resolution included restoring the Tiffany Studios’ bronze and iron window grilles, cleaning areas of the stone and terra cotta that had been darkened and stained, and upgrading the building’s lightning protection system. Removing and restoring the monumental bronze grilles (originally fabricated by Tiffany Studios) located on windows at the building’s upper stories on the north and south faces of the end pavilions; replacing the corroded internal steel bars with bronze bar, cleaning the grilles with a low-pressure abrasive process, and refinishing them with a brown patina and a clear-coat finish. Replacing over two thousand linear feet of built in metal gutters and valleys of the terra cotta tile roof – while the building remained open and collections in place; he new gutters are stainless steel and the running joints are welded to be as strong as the surrounding metal. Below the metal gutter, a secondary waterproof membrane with its own drain system was added. As part of the Philadelphia Art Museum, the Rodin Museum was originally built (as a gift to the city of Philadelphia by Jules E. Mastbaum to the Commissioners of Fairmount Park in April 1926) for the display of his collection of sculptures by Auguste Rodin. The building was designed by Paul P. Cret, who collaborated with Jacques Greber for the design of the gardens. Greber also designed the Ben Franklin Parkway upon which both the Rodin Museum and Philadelphia Museum are located. In 2011, VITETTA was hired to restore the interior of the building to reinstate Cret’s original design intent. Previous interior renovations over the course of the last 80 years had altered the historic finishes, lighting, and services in the building thus shifting the interior’s aesthetic away from Cret’s original design. Careful review of the available historical documents has guided the interior restoration of the building. The marble wainscoting and terrazzo flooring will be cleaned and repaired and the finishes of the galleries will be restored back to the original colors and materials of the Cret design. The renovations include upgrading the existing mechanical, electrical, security and lighting systems as well as renovating the restrooms. As well, the lighting in the galleries will be updated with modern fixtures that are versatile enough to accommodate the rotating exhibits within the gallery. After a thermal analysis, it was determined that the Museum would also benefit from the addition of new interior storm windows. Since the existing non-historic security grilles would be removed, the new interior storm windows were designed to accommodate both security and thermal enhancements for the building.